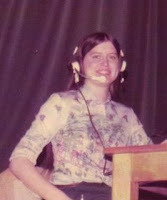 Be sure to tune in later this week for When I Was Just a Kid...Carmen Leal, who hosts this conference. An interesting story and an interesting lady with a heart for those who care for others. You won't want to miss this conference, so register if you can. 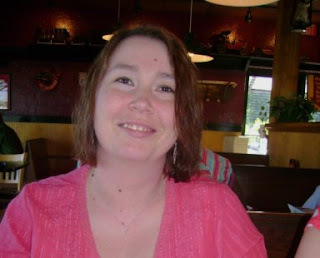 This is what you'll find on freelance writer and community mental health counselor Nancy J. Ring's blog. That, and a whole lot of wisdom and truths that just leave you breathless. I am having a tough time telling you just one post to read, so let's just say that you should read the whole thing including quotes, favorites, and things. Last year she graduated with a Master’s in Community Counseling and now has her Licensed Professional Counselor (LPC) certification. She works with adults who have severe and persistent mental illness, so she knows a lot about how it can be tough to find the path home. She's worked at the same place for nearly 10 years and loves that her work focuses on helping people achieve their vocational goals, as well as working on emotional health and well being. When asked about how all of this affects her writing she said,"Helping people become who they are meant to be is a theme that runs through my writing, my counseling, and my ministry." I know I gain many insights into myself and my own writing from Nancy and her blog. Plus, she has been a writing buddy in my Struggling Artists of Literary Talent (SALT) for many years, so I love her as a sister. 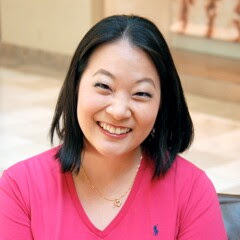 Nancy writes nonfiction articles for women, adults, and teens on all kinds of inspirational, Christian living topics. 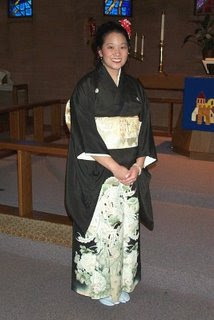 She's also written Sunday School curriculum for her church and award-winning grants for her vocational program at work. Nancy says, "It’s helped me find my voice, connect with other writers, and helped me identify writing topics I might not have otherwise considered." Childhood Ambition: When I was a kid, I wanted to be a doctor, a gymnast, a scientist, and an artist. Sadly, I wasn’t very good at any of these things. When I discovered how much math with required to be a scientist or doctor, I ditched those goals right away. Fondest Memory: Ok, I’m having trouble coming up with one stand-out memory. I think it’s mostly the little memories that I’m fond of. Our family Christmas traditions, getting ice cream or Gene & Jude’s hot dogs when me & my brother had good report cards, having my aunt’s family over for brunch after church on Sunday. I’m sure there’s more extraordinary memories, but these are the ones I recall at the moment. Crystal Editor comment: I love it that Nancy remembers food. Me, too! Crystal Editor comment: Ok, raise your hands: How many of you had to go look up quadratic formula? Much less has learned it? Favorite Childhood Book: I read all the time when I was a kid. My mom would buy me chapter books at the beginning of a shopping trip to keep me quiet and by the time she finished shopping I was always asking for another one to sustain me over the car ride home. So while it’s hard to pick just one book, I’d have to say my favorite is The Hobbit by JRR Tolkien. This was the book that made me decide I wanted to be a writer. I remember reading the opening paragraphs and trying to figure out what the magic stuff among the words, what made those words do what they did. Favorite Childhood Activity: Well, there was reading of course. And playing on the swings. I still loved to do that. The neighbors across the street had a swing set, but we never did. When my parents did some renovating in the backyard I lobbied for a swing set. Instead, they put up a 2-car garage. My beloved lilac bush was also sacrificed in favor of this ugly, mustard yellow & brown monstrosity. Mom would say that it was “her” lilac bush, but it’s not like she lobbied to save it from the invasion of the garage. My screen name on Shelfari is Njring121. Come find me & I’ll be your friend. My Bryce-Bryce Ba-beee's day. 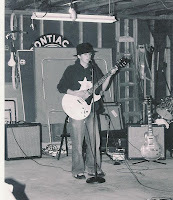 Nineteen with guitar in hand! That reminds me, did you have posters on your wall as a kid or a college student? I did! (ha, you knew it.) It was cheap and kitschy art. Because I was an elementary education major, I also made my share of posters and bulletin boards. In college the guy I was dating from another university (I married this guy) bought me this huge poster of Snoopy for Valentine's Day instead of a card (or it was his creative card.) I loved Peanuts, particularly Snoopy. One of the things I wanted to be when I grew up was a cartoonist. I still collect cartoons and cartoon books. Anyway, I still have this poster. It is in my basement in a dark corner. I need to go get it and put it up again. It is now vintage! I also have a poster of the Gone with the Wind movie.Also given to me by my now-husband-then-boyfriend.Also in college.Also, vintage, though then it was a new copy. I have a page ripped from a magazine that should be a poster. Monica Sheehan is an author/artist who is the 11th of 12 kids in an Irish/Catholic family and she's the artist/writer of this page. She has books, but I never have read/looked at them. Maybe I should. She grew up funny, but she jokes(but it's no joke) in this bio I've linked: "For breakfast,I have a cup of coffee and two cigarettes. I stare out the window just long enough to get an anxiety attack. " Someone said to me one time, "You read books? And get paid to do it??" (gasping) "Man, I would love a job like that!" Well, duh, me, too. I worked hard to get to the place where I'd not only get a free book, but would get paid to read it. (Granted, I didn't get paid a lot.) It's not an easy road just because you like to do it. You have to choose happiness, but that doesn't mean it is won easily. And yes, even in jobs that we love and it feels as if you would pay to do the job, not someone pay you, even then, we have days that feel like work. But what's that old saying? Something about when doing your hobby and having frustrations, it's still better than working! Going back to Stephen King's quote from yesterday, somehow you need to be doing the thing you're given to do--if you are paid for it or not. And don't ever say to me, "Oh, yeah, I could write if I just had time." You make time, make choices every day. If you should be writing, make priorities. In Delia's blog today, Camy Tang talks about this very thing. Hop over to Gatorskunkz and Mudcats and read how Camy protected her creative time. If you could do anything, and get paid to do it, what (specifically) would it be? If it is writing books, what kinds of books? Then, do a little of that everyday. If you look over at Bonnie Bruno's site, you know what I mean about finding the joy in what you do. I have no idea where I found this poster. If you know, let me know. But it is cool. I have hundreds of writing books on craft. Of course, I have my favorites that I pull out whenever I want. I think my favorite advice on writing came from Stephen King's On Writing: "If God gives you something you can do, why in God's name wouldn't you do it?" Now, some of you may be offended by his use of "in God's name," but overlooking that--what is he saying? (You know I'm going to 'splain it in my own way, Lucy. )He's saying if God gives you something you CAN do, it is incredulous to him that you'd tell God that He didn't know what He was doing when He gave it to you to do. Whoa. A little jolt of conviction, huh? Can I get an amen from the choir? Of course, you know I'm talking to myself here, not just to you. What a little cutie. Delia has a way of warming you just by her happy, positive talk, and she could've grown into a bitter woman, but Jesus came into her life and well, it's a happy story, in spite of the ups and downs. Her famous blog, Gatorskunkz and Mudcats, is like a serial addiction for me. I have to get a dose of Delia whenever I'm having one of those days. She is passionate about her family (and they are in her blog as "characters," like her husband,The Honey, and The Kiddos) and she promotes causes that most of us relate to. Delia just makes the world a better place. She is open and honest (check out her frank discussions on child-raising!) and I wish she lived closer (wanna be a Hoosier?) so those of us in the Indiana ACFW could have her.Delia is precious and you will see why I adore her so. What is not to love with someone like her? When I was a kid I wanted to do everything. I went through all the phases; doctor, lawyer, police officer, truck driver, etc. Yes, at one time I wanted to be a truck driver. There were also quite a few members of my family who had joined the military and I even went through a phase where I wanted to join the Marines. 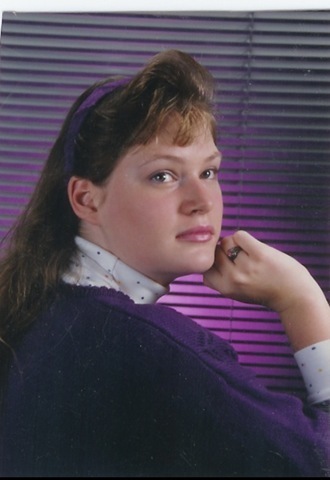 Then, about halfway through my teens I decided I wanted to be a nurse and that stuck with me until I got older and worked in a nursing facility. I soon realized that I just was not cut out for it. I loved caring for people but the other, more medical side of nursing just wasn’t for me. All of my life there was the love of writing, which I'm sure stemmed from my love of reading, but it never seemed like it was something I could do. Authors were like celebrities to me (they still are) and I didn’t think that just an average Jane like myself could do it. It never occurred to me that I could be a writer and write the stories that I love and try to get them published until just a few years ago. Then I kept my aspirations to myself. Everyone knew I loved writing but it was something just for fun and no one suspected that I would ever want to do anything with the stories that I wrote. I still haven’t had anything published but I’m doing what I love and that’s what matters. When we were younger we weren’t close to our real grandparents and we sort of adopted an older couple to play that role in our lives. I’m not exactly sure how we knew them but they were always a part of our family. We called them our Mom-mom and Papa. My mama was a single parent who worked a lot and they were our main babysitters. 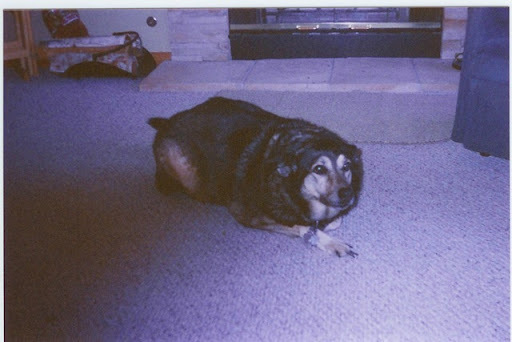 Then when we got too old for a babysitter we would go visit them as often as we could and during the summer I would sweet talk Mama into letting me spend a couple of weeks at a time with them. Papa had an old swing house right smack in the middle of the yard and when I would go visit he and I would sit out in the swing in the evenings and discuss anything and everything that came to mind and then sometimes we would just swing. I learned a lot about God and life in that old swing house with my Papa and it was a sad, sad day when it was torn down. I have so many proud moments in my life but my proudest moments would have to be when each of my children were born and I saw the beautiful babies that God was entrusting me with. My Mama got mixed up in a bad marriage when I was a kid and we saw a lot of things that children shouldn’t have to see. Overcoming the feelings of anger and shame that it all induced took a long time for me and it was definitely the hardest challenge I had to face when I was younger. My first job was in a sewing factory when I was seventeen years old. I accrued enough credits that I was able to graduate in the middle of my senior year so I decided to get a job and try to save some money. There was a sewing factory in town hiring and I figured I could make more money there then I could at a fast food restaurant so I eagerly applied. Ha! It was a horrible experience and I didn’t work there long. I don’t know whether to tell you that my indulgence was books or to tell you that it was those little candy necklaces with all the candy pieces strung on a piece of elastic. Because back then both were equally important to my child’s mind. Books took me on so many wonderful adventures and let me see into so many different worlds and I was constantly reading something. (Now don’t laugh…) But those candy necklaces made me feel like a princess. Think about it, only a princess could have such a colorful necklace that not only made her beautiful but when she needed a little snack, she could just lift it up and take a bite! I’m sure my mama would’ve liked it if I’d just stuck with the books then she wouldn’t have had to cart around a child with a piece of elastic wrapped around the big colorful ring stain on her neck all those times when the candy was gone and I refused to give up my princess necklace. My memory isn’t all that grand Crystal, but I can vaguely remember a dress that I once loved and some red patent leather shoes that I tried to never take off. Oh, there were so many; The Little House books by Laura Ingalls Wilder, Judy Blume, Beverly Cleary (what little girl didn’t love Ramona? ), and everything else I could get my hands on to read. Dancing. I loved to dance and would only need the music in my head. I never cared where I was or who was watching me, if I felt like dancing- which I did most of the time- I would dance. Now you know some of why I love Delia and hope I can meet her in person one day. (I'm still laughing over the candy necklaces, and I love it that she danced to the music in her head. )Delia, write stories that you fictionalize about YOU. We will read them! 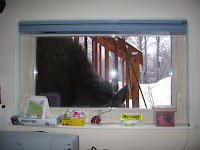 Or how about a bear clawing at your windows, leaving marks where he could've easily come in? How about that time that the kids had to take a different route to school because moose were scrounging around the bus stop? And oh, yeah, the time your car blew across the ice in the school parking lot because of a winter storm. Who can forget watching your kids play in a huge state soccer tournament at midnight because that's when the Midnight Sun is most beautiful? Yeah, well, if you are like me, you are fascinated by the life of Paula Lindstam, wife, mom,Bible study leader,writer, real estate agent and general-all-around adventurer. Her husband, also a real estate agent and a pilot, flies people around--because sometimes that is the only way to get there. I've been in a critique group with Paula for years and this woman has written some of my favorite stories. Her characters, settings and voice are rich with the experiences she has lived and observed as a lifetime resident of our huge state to the north--Alaska. She thinks nothing of hopping a plane and traveling the world. Her kids are confident and independent. And why wouldn't they be? 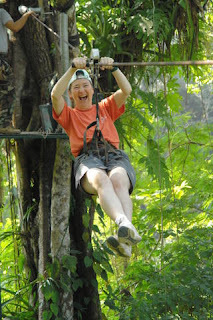 Check out a recent photo of Paula taking a ride (which she loved) on a canopy rip-line! 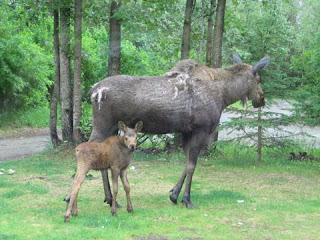 So, what is it like growing up in last frontier--Alaska? Tell us about the places you have lived in Alaska.Where did you live? Around the state of Alaska, mostly. (A little time in Washington state.) I moved from house to house seventeen times by the time I was nineteen years old. My dad worked for the Weather Bureau on and off for over thirty years and we moved from town to town for his job. The highlights are that I was born in Nome, have lived in Anchorage three times, (including the present,) lived in Fairbanks and, briefly, in Delta Jct., graduated from high school in Naknek while living fifteen miles away in King Salmon (twice). Childhood Ambition: I just can't think of anything. I'm not one who has always known what she wanted to be when she grew up and worked toward that end. Life unfurled as I went along. I can't say that I really enjoyed picking berries with my mother at the time, but as I look back it was a really sweet time. No matter where we lived in Alaska we picked local berries and my mother made jams and jellies and all manner of delicious things. I learned the names of the berries and where they grew, what they looked like. Black currants in the dark, dim woods near the Anchorage airport. Raspberries in sunny spots along the gravel road up on the hillside. Blueberries in the muskegs. I was very good about putting the berries in the bucket and not eating them. If I ate them it meant we would be picking longer and I usually wanted to be doing something more active. I took a scuba diving class in Sitka, Alaska when I was going to college there. My proudest moment was when I got my open water dive certificate. Years later, the first time I ran into my diving instructor, he told me I was his first female student. It was a different world then. Learning to drive the motorcycle I bought when I was sixteen. It was a Honda 100 and learning to drive the clutch was an agony I thought would never end. It took a good day, at least. I didn't learn to drive a car until a couple years later and the how-to-use-a-clutch lessons from the motorcycle stood me in good stead. In the Alaska Bush the state offered an Off-System Driver's License in order to legally drive there. No driving test was required. The only road was fifteen miles from King Salmon to Naknek in one direction and King Salmon to Naknek Lake in another direction. I got my first real car driver's license when I moved to Anchorage in 1981 when I was 24 years old. I was a maid at the hotel in King Salmon, Alaska. The clientele were nearly all men, usually villagers stranded by weather, construction crews, or German sport fishermen. I still fold my towels the way I was taught at the hotel. The Germans would leave Swiss chocolates on their pillows for the maids. Mmmm. I don't think I'd known what real chocolate tasted like until then. Reading, reading, reading. My favorites were biographies of first ladies. I also liked the Narnia series. 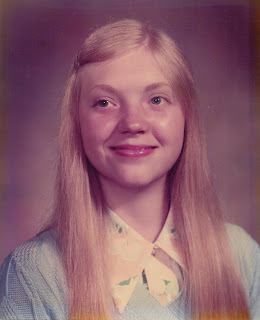 In 1970, when I was thirteen, we moved to Fairbanks and lived in a small apartment for the summer. In an effort to find something for us to do my mother would take us to the library once a week. I think I read every book that a girl might want to read and was begging for more. There wasn't much to do and I just ate them up. Girls weren't allowed to wear pants to school so my mother made all my clothes, which were dresses until I was in junior high. When I was six, she bought me a dress to wear for a picture taken of me and my brothers. I loved it! A store-bought dress. We still talk about it. 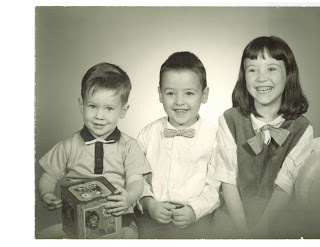 (That's the dress in the above photo: Ralph, Duane and Paula in 1964. )It was the only studio picture ever taken of our family until we were adults. It was taken in Olympia, Washington where we lived my first semester of the first grade. We finally had access to a photographer/studio. Swinging through the trees near my house in Anchorage. Someone set up a trapeze-like swing in the trees. We'd run and take a flying leap at it, hopefully grasp it, swing aways, and then let go and drop onto the dirt path below. I went to a movie theater for the first time to see Mary Poppins. I was a young adult before I watched many movies. In the places we lived where we had television my favorites were Get Smart and My Three Sons. Meet the Austins by Madeleine L'Engle. I also liked The Four Story Mistake by Elizabeth Enright. Childhood Hero: My dad was and is, the smartest person that I know. My childhood was filled with such interesting people. It seems that if someone runs away from their life, they go to an exotic locale and start over. Alaska is one of those places they run to, so when I was a child my family tended to meet and befriend people with the most varied backgrounds. I like to weave those incongruous tidbits into my characters' personalities. The skinny old man wearing overalls as he swamps out the vacant apartment probably owns the building and used to be a top defense attorney in another state until his wife left him and his secretary embezzled all his money. I met people with outrageous stories like that all the time growing up. It really helps one not to leap to conclusions based upon looks. You are Jasmine. You are loyal and would visit the ends of the earth for what you believe. You would never let obstacles stand in the way of true love. What Should You Have Done After High School? You should have traveled the world. You're outgoing and you like to try new things. You'd do great in a college environment, but you won't be able to focus on school until you fulfill your inner desires to get out and see the world. Everyday I hear from some struggling writer--some published, some not. They tell me stuff about the struggle, but sometimes I think they forget just how much they have already overcome. Reminds me of my bootcamp class I took a few years back. We had an ex-Navy S.E.A.L.-trained instructor and he would actually turn red telling us what he wanted us to accomplish. He took it as a personal affront anytime we said, "I can't," or in his view, "I won't." So far, no one is holding a gun to our heads here to write something. Where did we get that feeling that someone is? But I understand better these days why Instructor Brown turned red a lot. I feel like him sometimes. How did you come into writing? Who encouraged you? (I hope some of you feel that I have encouraged you. )I'll tell you about some of my story in writing. Maybe you can encourage me by telling me what seems to be my best path in this business? I still haven't quite figured it out. I think in encouraging others, we often figure it for ourselves, so maybe this is how. (That giving-out-comes-back-to-you. )One thing I've noticed since starting this blog is that I see how the writer came to be by examining their past. My turn. Maybe it'll help you, too. I probably had the most negative experiences in writing before high school. In elementary school I was a fabulous actress(I was also voted best actress of my high school,) good in art, an "A" student. I was often picked to tutor other kids or to monitor/encourage other kids to "be good." Something about my presence evidently was a good influence on other kids. I will never forget Mr. Rosen making me sit in the nest of bad boys of our class. 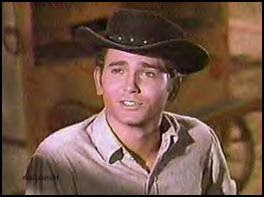 There was Gene Cohen, Gene (why were all the "bad boys" named Gene?) Black and Miles Kendall*. (I'm sure they grew up to be model citizens.) Well, maybe this is another story. The point was, teachers recognized many things in me and I had much encouragement for those traits/gifts, but writing didn't seem to be one of them. I was a great(you might can see why I'm not a successful writer--if I were judging this piece, great would have to go! That, and exclamation points) English student, but I was rejected over and over for writing "jobs." In junior high, though my English teachers adored me, even inviting me to their homes, I wasn't picked for the school newspaper or told "You should be a writer." I got so-so comments for everything I wrote except my "journal." And I held back in my journal. You should've seen my personal journal I kept at home! (You can't; I burned it just before going off to college in case I died. )My biggest gift was being a reader, summing up and criticizing already written stuff. And I could explain it to other kids. My freshman year I wrote a poem that was published in a book. I can't even remember it except what it was about--something about God and the sea and how God commands the sea to toss waves that kill. Sheesh. I was a dark kid. But finally, my big break came. probably was the worst.I can't even remember what he taught. Maybe auto shop or something. I kept up his scrapbook for him, too, in the library where I also worked in HS, and he never once said thank you.He did growl at me--a lot! (I didn't have him for class, however. )He would squint those black eyes at me and something gutteral would come out. His wife was the business teacher and our sponsor in booster club--and I was president. I figured if she was married to him, I was somewhat safe because I figured she was the only one keeping him from running amuck on kids. About half-way through my senior year Mrs. Bragg came in with guidelines for a journalism scholarship at the university in the next county over. I had to take all of my articles and compile them into a portfolio to try out for the scholarship. I won the scholarship and that determined where I went to college, being a kid with no money. That time as sports editor, however, cemented in me a "no fear" attitude. I used to think, "Hey,what can you do--kill me?" (And if not, I wrote and tried to prove to them I could do ok at it. )As a kid, I was always concerned about getting killed since every weekend I somehow survived my dad's down days. Getting to Monday alive was a major accomplishment for me. Maybe that was how I got so good at keeping mean boys in line--I already had practice every weekend. Writing a stupid article in a newspaper was non-threatening to me as I had already had a whole weekend of being told how worthless I was, but still seeing the truth was, I was not as bad as I was told. season, so I was probably flirting with the edges of his patience.Mrs. Gallo always smiled at me and even gave me a silver I.D. bracelet with my name on it. How bad could Crazy Joe be if he was married to an angel? too. Bless her. She was short, but mighty. I always thought I won that writing scholarship for my writing. Years later, (like now) I have come to conclude that maybe it wasn't for my writing, afterall. Writing is a tough job and you can be a wonderful writer, but still not get published. So, how do you get published? You have to get tough. I will have some posts on this topic in the coming days. Stay tuned. You're all grown up, and I'm still as delighted in you as the moment I first laid eyes on you! I always wanted to be a novelist, as soon as I knew what a "job" was. I wrote to Anne McCaffrey and she wrote back to me! From Ireland! Getting the call from my agent that I'd sold.Actually,it was an answering machine message which is still on the machine, plus my husband(AKA Captain Caffeine)recorded it onto an MP3 for me (yes, I'm that pathetic). I was very shy as a child and very awkward socially.I was also extremely insecure in my personality and it wasn't until after college that I started realizing I can be who I want to be and not apologize for it.That's about the time I stopped being shy,too. Mom always bought me a book when we went to the mall. I love Christian Chick Lit and Camy has her list here. Other people talking about Camy this month! She is also a Story Sensei and will help doctor your ailing manuscript if you are an aspiring novelist, like Camy as a little girl. 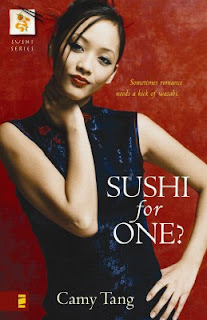 Labels: American Christian Fiction Writers, Camy Tang, Christian authors, Christian books, Christian chick lit, Romance with a Kick of Wasabi, Sushi for One? See this post for interview! 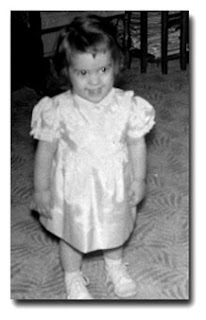 When Bonnie Bruno was three, she "stole" a grape and her dad gave her a penny and made her pay the clerk. It was her first lesson in honesty and the first of many lessons from her parents and older siblings. Bonnie was from a family of 8-is-enough. She remembers for three-fourths of her childhood only having one bathroom. Let's see, one bathroom, 8 people. Bonnie, master of understatement said,"Mornings were interesting, especially when four of us six kids reached our teens." 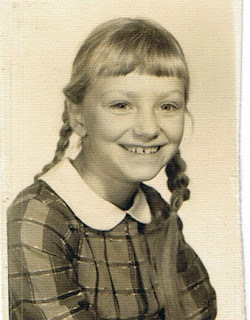 Bonnie says as a child she decided to surprise her mom and pulled a chair up to the kitchen sink, dumped in a whole bottle of dish soap and tried washing the dinner dishes. "One by one, they slipped through my fingers onto the floor. She and my dad were so shocked, they thanked me and said they’d been wanting new dishes anyway." To me this shows just what loving parents Bonnie must've had, and may be why she is such a kind person herself. And Bonnie didn't have a grandmother for long, but she is a doting and loving grandmother. Her dad’s mom died before her parents met, and her mom’s mother died when she was four. But Bonnie learned what it meant to be a grandmother from her beloved weekends at "Grandma" Bessie’s house. "She was the widowed grandmother of my best friend, and lived by herself on a farm. She taught us how to milk cows, gather eggs, and swing from a rope and drop onto a hayloft." Childhood Ambition: I wanted to become a teacher, a mommy, a writer, a forest ranger, and an archaeologist. I just didn’t know that I couldn’t wear that many hats. Fondest Memory (then): I come from a large family of eight. Every other summer, we’d take a cross-country vacation—all of us stuffed in a station wagon (I know this dates me) without A/C. Two weeks! My parents were very brave people. Proudest Moment (then): When I realized I could read all by myself. I was four years old and my third-grade brother, Ted, taught me the alphabet and all the letter sounds. Every afternoon after school, I’d ask him to teach me how to read his book, and he finally got tired of me pestering him. He gave me the book, told me to practice, and that’s what I did—under my blanket every night with a flashlight. Biggest Challenge as a child or teen: Finding time alone with a parent. Our household of eight was like a freeway interchange. My First Job: I worked part-time for an insurance broker who talked nonstop about his state business awards. I left the office every day with a headache. 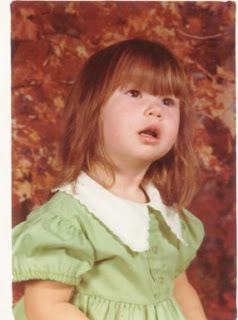 Favorite Outfit as a Child: A white dress with an orange butterfly print, which my dad bought for eighth birthday. I liked how the skirt twirled when I spun around. Favorite Childhood Book: Angus and the Ducks, by Marjorie Flack. This is the very first book I learned to read myself (borrowed from my brother). Later, I found it at the library, and was amazed to learn that the author had written other books. It was the first time I thought about how real people write the books we read—it’s all about good ideas. When I was in my forties, I looked everywhere for a copy of Angus and the Ducks, and couldn’t track one down. My husband Nick found one at a used bookstore for me. When mainstream publishers began bringing back some of the classics from the fifties, Angus and the Ducks resurfaced. Childhood Hero: My brother Gary, who accidentally shot a bird with his new bb gun and cried when it fell to the ground. He works as a charge nurse for a busy ER at a California hospital – no surprise, because of his compassionate heart. Nicknames as a child? My mom sometimes called me Birdy Brain because I’d daydream and would lose track of what I was suppose to be doing. Favorite Activity as a Child: Playing in the orange orchard behind our house with my two older brothers. Our imaginations ran wild, and we’d build forts or tiny “farms” in the dirt with popsicle sticks, sprigs of plants for miniature trees, plastic farm animals, and a garden hose for irrigation. It was life in miniature. Now I capture life through macrophotography—nature up close. I look for “hidden treasures” that sometimes go unnoticed because we’re in such a rush, it seems. 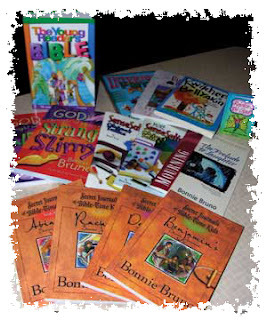 Bonnie Bruno has been writing professionally for 27 years, specializing in children's books, articles, columns, and stories for both the inspirational and general marketplace. 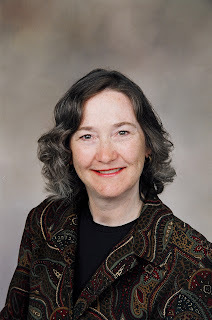 Her work has been published over 450 times in 40+ different magazines and newspapers, and she has written books for Zondervan, Standard Publishing, Cook Communications, Intervarsity Press, and No Starch Press. She sold her first two stories to a children's magazine while she was a student at The Institute of Children's Literature, and returned many years later to join their faculty as an instructor. 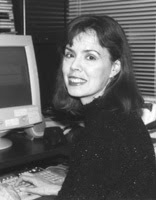 A former family computing columnist for Newsday (1997-2000), Bonnie has also written technology-related columns for ParentLife and Living with Teenagers magazines. Her love for variety led her to work with several greeting card companies, where she produced 150 greeting cards, posters, postcards, calendars, and gift items. Her cards have appeared on the retail racks of Hallmark, Oatmeal Studios, Paramount Cards, and Argus Communications. 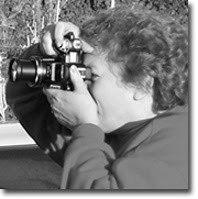 These days Bonnie is a nature photographer as well as a writer,though she is mostly pursuing the photography. If you would like to have the Photo Buffet on your web site or blog, look at the logo to the right and click on it to download the widget. 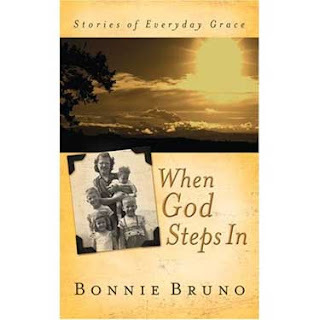 When God Steps In: Stories of Everyday Grace,Standard Publishing. Bonnie writes a monthly column for Christian Women Online called “Retrospect”. Light & Life will be publishing several of my photos for an article about the life of a vineyard, written by the son of a vineyard keeper. It will be in the November/December issue of LLM. I spent a full year gathering photos of the different stages of vineyard growth for this assignment, which ties in with the Scripture passage about 'I am the Vine, you are the branches...' It was a good reminder for me as I worked--a blessing." And do you have kids? Take them to Bonnie's WonderKorner: Where Education Meets Fun! Do you need to find a quote? Here's Bonnie's reference page. If you notice to the top right I have listed the people I have lined up for September interviews in the When I Was Just a Kid feature. Please drop back by for more stories. I want to try and blog at least 3 times a week. My schedule and the weather have prevented me from posting more often (we have satellite internet. )I will try to be more deliberate. I love to read and I'm a fast reader when I set my mind to it. I used to review books for magazines and I still have stacks of those books that I never was able to get to--until now. At the right, scroll down to my September list. What's the best book you've read in recent times? I'm currently finishing up Lauren Winner's Girl Meets God. We're going to discuss this book in my writer's group. 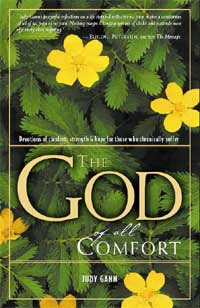 Karen Wingate: Favorite Childhood Book: My favorite was the one I currently held in my hands – with a few exceptions. I think some day I will ask for the writers' favorite book lists during turning points in their lives. I noticed that in my own thinking about my favorite books, ones that stood out to me also came at significant times in my life. Now, leave a comment(and tell all of your friends about it) to tell me what your favorite childhood book was (or author) AND your current favorite book (or author.) If I get any comments, I'll leave my favorites in the comment section. If I get more than five comments, I'll draw a name for a $5. Amazon gift certificate next Monday! Over at The Edgy Inspirational Author, Michelle Sutton gives away tons of books. That makes her really nice in my book. Yesterday, aw shucks, she went and bestowed me with a Nice Blogger Award. I want to thank my mother, whose birthday would've been yesterday, for raising me up right nice. I'd have been a mess if she hadn't worked on me. Nancy J. Ring at Anchors, Signposts and Wanderings where she invites readers to join her on "Forks, bends, detours, scenery, and fellow travelers I've discovered while Exploring the Path Home." She has been my friend and even a critiquer for many years, seeing me through many stages of my development. LeAnne Martin at Christians in the Arts is my next choice. This award probably won't show up on her blog, because she is too busy being nice by featuring some of the best artists in the nation on her blog. LeAnne, like Nancy, has been in my critique/friendship group, helping me along, adding SALT in my life. Teena Stewart, another friend from my SALT group with whom I've even co-authored articles,is over at Whispers in the Dark, a blog about suspense writing. Teena has a book coming out on Small Groups soon, and I'll be featuring her when that happens. I'll also be talking about her move across the country to open a coffee shop ministry with her husband. Delia at Gatorskunkz and Mudcats is really nice and was one of the very first people to post a comment here. She inspires me to be a better person and to write more. I can't imagine blogging without Delia. Sabrina Fox is my Hoosier writing and reader buddy who helps to navigate while I'm driving my Jeep, too. She speaks kind words about everyone, even when they are a little ouchy. I've never heard her speak ill of anyone. Cara Putnam is a controlled F-5 tornado! She has more energy in her little toe than I have, well, in my whole foot (and then some.) But she always takes time to share her joys and prod slowpokes, and work on my perfectionism in a nice way. She has several books coming out over the next few years. Mary Connealy was my first victim, er, interview in the Chat 'n' Chew Cafe'. Not only is she a good sport, she shares with us her techno-disasters (I'm not sure why she isn't writing disaster movies--remember Towering Inferno, The Poseidon Adventure, the Titanic, and Airplane? Stuff like that? Mary kind of lives it in cyberspace. )She makes me laugh and pats me on the head once in a while. Now, ever'body mind yer manners and pass that gravy over here. P.S. Some of the above will be featured in When I Was Just a Kid this month, so be sure to check back for those! 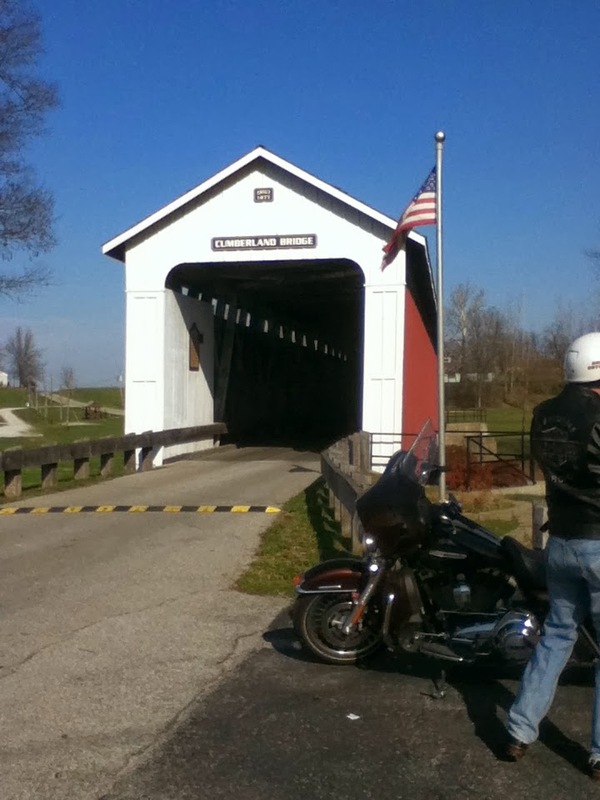 Susan says, "My father was the game warden there for many years, and our family had lived in town for seven generations." Susan always made up stories and enjoyed make-believe play. "I have a few stories I wrote as a child, including Marooned on an Island and House of the Dead. Oh, yeah. Nowadays my books have titles like Frasier Island and Homicide at Blue Heron Lake." 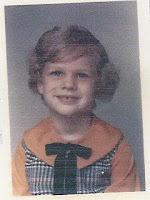 Susan was the youngest of five children, and admits to feeling an extreme rivalry with the sister next to her in age. Susan explains,"Now, in our adulthood, I can see that it was mostly in my head, and Mim and I are very close. But there were times when we demanded that our bunkbeds be dismantled so we could sleep on opposite sides of the room and drew a line down the floor between." Susan also has a nickname. "They tell me that when I was very young I saw the Disney cartoon 'The Water Babies,' and I insisted on being called “Water Baby” for quite some time. When my siblings want to get a rise out of me 50 years later, they still call me 'Water Baby.'" Susan remembers a wonderful childhood in a big old house with loving parents and tolerant siblings. 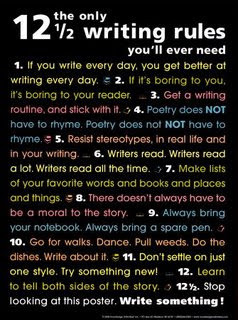 And what makes you into the writer you are today? 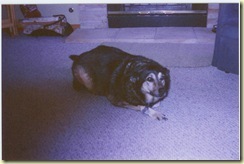 Susan says,"We had lots of books, and both my parents were avid readers. We had space to ramble, play Indians, build tree houses, and keep a horse when I got older. I always thought we were poor, but now I see we were very rich, though the income was small. When I was very young, I thought I’d like to own a hotel and be able to put mail and keys in all those pigeonholes behind the desk for guests. Later I thought I’d like to follow my father’s footsteps as a game warden. In the 8-to-10 age period, I salvaged outdated report forms from his den wastebasket and filled out dozens of fictional boating accidents, crop damage, and night hunting reports. Going with my Dad in the old station wagon and bringing home ten sheep (nine ewes and a ram) to add to our small farm’s livestock. Also, my oldest sister Pat used to “play school” with me in the evening when I was about four. She started teaching me French, geography, and other subjects that I thought were just wonderful and very grown up. Then—When my kindergarten teacher wrote my mother a note (and I could read it) saying she thought I should skip into second grade the next year. Now—There are so many to choose from! Seeing all of our six children together again at our older son’s wedding was great. He went off to college a week before our youngest was born, so they haven’t all six been together much. Seeing what our family had become was priceless. I always felt I was the uncoordinated one. Of four sisters, I was the only one who never made the cheerleading squad in our tiny school, never could do a real cartwheel, and never could whistle right (only breathing in). Eventually I came to terms with this and found there WERE things I could do (swimming, horseback riding, etc.). I was horribly shy, but have gotten over that by working as a news correspondent, which forces you to buttonhole strangers with the most embarrassing questions! (I still can’t whistle or do a cartwheel). Picking strawberries for 8 cents a quart. Mickey Mouse Club paper dolls. I still have Karen and Cubby. White T-shirt with a blue color block on the left third of the front, and two little fish swimming in the blue part. With shorts or khakis. Playing “Bonanza” in the upstairs of our barn. We used old bed headboards and footboards for the false fronts of buildings in our own Virginia City. And jumping in the hayloft full of hay. The Wizard of Oz. We didn’t have a TV at first, but our mother let us go to the neighbors’ and watch Oz when it came on once a year. That would be a toss up between my Dad, Teddy Roosevelt, and Little Joe Cartwright (we got a TV later.) I guess Dad wins, because he was really there. My father taught me a love of history and heritage. 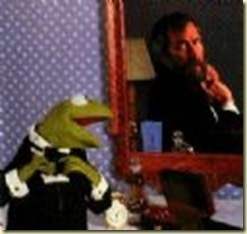 He instilled in all of us respect for family and forbears. I’ve written eight historical novels so far for Heartsong Presents, and I often think of Dad as I’m researching. In his last few years, if I told him what time period I was writing about, he would scour yard sales and used book shops to bring me appropriate material. You can find more about Susan on her web page. And you will want to visit this page as she gives away one of her books each month. The winner chooses the title preferred. 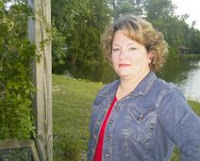 She's also a host at Keep Me In Suspense, a site for writers of Christian mystery and suspense. And today is the release date for Finding Marie (Harvest House,) a romantic suspense sequel to Frasier Island.Frasier Island was the October 2007 featured selection in Books-A-Million’s Faithpoint Book Club. Marie Belanger finds a computer flash drive in her luggage at the airport and learns the woman she sat beside on the plane from Tokyo was murdered. Her journey from San Francisco to Maine becomes a nightmare. Marie runs for her life, not knowing the significance of the data she carries. Her husband, Navy Lieutenant Pierre Belanger, contacts his best friend, George Hudson, and together they set out on a search for Marie that spans the country. Knowing the stakes—Marie’s life and betrayal of an international plot—drives them. But they seem to stay one step behind their enemies, who are a step behind Marie. Homicide at Blue Heron Lake, written with her lovely daughter, Megan Davis(releases February 2008 from Heartsong Presents: Mysteries).